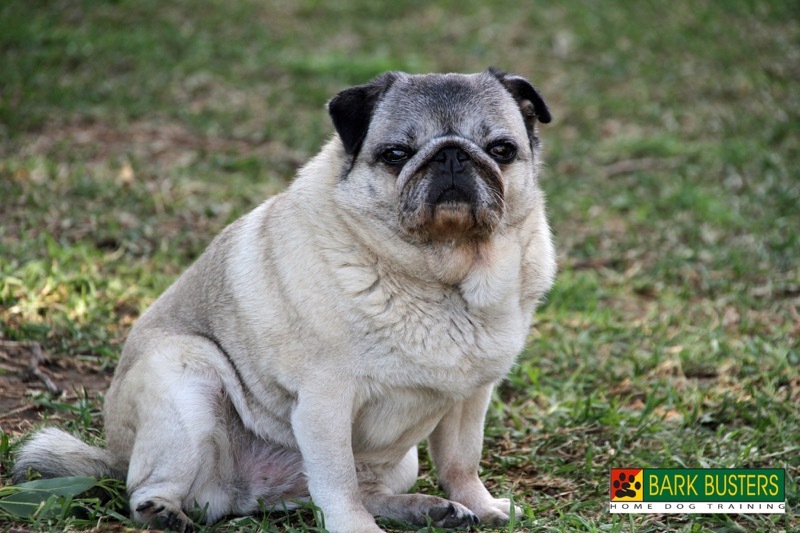 The Pug is an ancient Chinese dog breed with an impressive history, having been revered alongside royalty. The breed motto is "multum in parvo," a Latin phrase meaning a lot in a little - plenty of dog in a small package! Pugs are members of the toy breed category and have a strong, noble appearance. 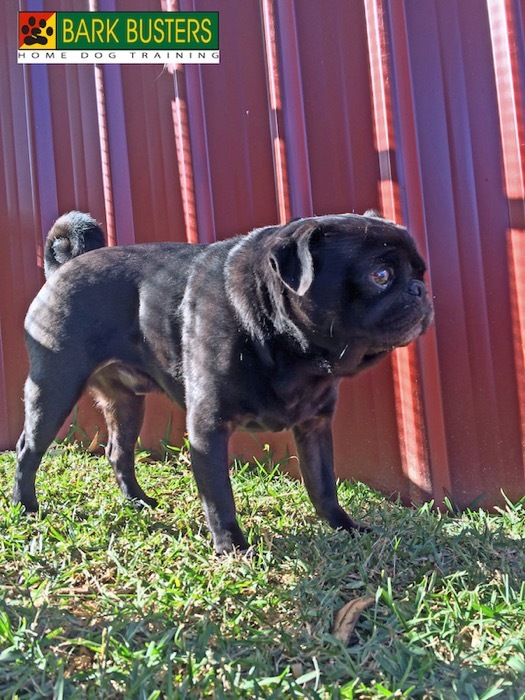 The Pug is possibly one of the strongest and sturdiest dogs in this breed category. This sturdiness, along with their impressive looks, is perhaps a big reason behind their popularity. It is believed that Pugs are related to the larger Mastiff dog breed and have been bred down to its diminutive size over many years. They do physically resemble a Mastiff in many ways, until you get to the tail. The ideal Pug tail should have two curls and stand proudly over the dog’s rump area. Pugs have well-round heads, a short flat muzzle, and lots of wrinkles on their forehead. These vertical wrinkles on the forehead is said to resemble the Chinese character for the word "prince" and thus is known as the "prince mark." The pug has a square body shape, a short dense double coat, and bulbous and prominent eyes that protrude. Like many of the flat-faced breeds, a Pug’s are prone to eye trauma because of their prominence. A Pug’s coat color can range from a fawn and an apricot shade to silver and black. The black dogs are the only color to not have a darker mask. Pug’s are strong and sturdy dogs with height generally ranging from 10 to 11 inches and weight from 14 to 18 pounds (six to eight kilograms). Their short pushed in face and wrinkled forehead make them appear wise and they look as though they understand everything you are saying. Their short dense, double coat makes them adaptable to most climates, but the very hot and humid days are not their friend. The Pug is little enough to take just about anywhere. The Pug is often thought of as coming from Holland, but the breed in fact originated in China. It is likely the breed was first transported to Holland via trading ships around 1572. History tells that it was a Pug’s barking which sounded the alarm to approaching Spanish soldiers in the late 1500s when Spain tried to take control of Holland. This Pug was credited with saving his master’s life - Prince William the Silent. The breed forever after has been associated with the Royal House of Orange. Napoleon’s wife owned a Pug, and the Duke and Duchess of Windsor owned a Pug as a royal companion. The Pug became the latest rage during Victorian England, and Pugs can be spotted in many paintings and other artwork of that time. Some believe the Pug’s name came from their likeness to a marmoset monkey, also called the ‘pug monkey,’ but the other theory is that the Pug name is derived from the Latin word ‘pugnus’ which means ‘fist’ - perhaps describing the breed’s round face and head. The Pug generally has a very even temperament with a somewhat sober side. They are sociable and usually get on well with other dogs. Pugs are also generally very good with children. They are more than happy to just hang out with their favorite human and often like to have their pet parents in sight. Pugs are known to sometimes have a stubborn streak, but we believe that it’s largely due to them not always being properly understood and a lack of proper education and obedience training. Pugs are the sturdiest dogs of the toy family, due to their mastiff heritage. Due to their short snout, Pug’s don’t do well in very hot or humid weather. Take caution in summer / warm months, and don’t over exercise this breed. Living up to 15 years of age, Pugs often enjoy a long lifespan. The Pug became even more popular in the U.S. following the release of “Men in Black.” The movie featured Frank, the speaking Pug who was really an alien in disguise. A very trainable breed, Pugs but won’t suffer fools lightly, you have to be in tune with their personality and understand what training best suits their needs. Despite their adaptability to training, Bark Busters still get calls to train lots of Pugs or to address behavioral issues. The main issues are barking, not coming when called, dog aggression, and/or separation anxiety. The Pug is a highly intelligent breed that adapts to training quite quickly providing their human is consistent and patient. Pugs are cute, cuddly, and knowing! The Pug is not hard at all to keep looking its best. A quick brush daily is best, making sure not to rip out any undercoat before its due to come out and definitely not in the winter. Once the season changes, you will need to give your Pug a regular brush. Be sure you pay special attention to the areas around the face where the folds are. The Pug does suffer skin conditions because of the many folds around its face which need regular attention. Make sure to keep those folds clean and free of dirt and grime. 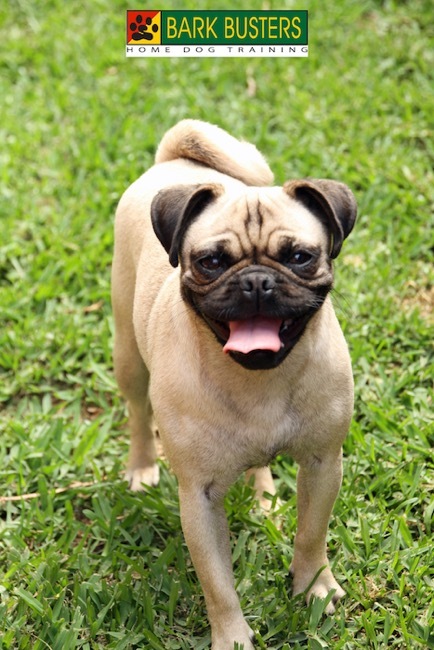 A regular visit to your vet is recommended to ensure your Pug does not develop any skin conditions. Diet does play a big role in skin conditions, so be sure your Pug has all of the nutrients it needs to stay healthy and without any skin issues. When I think of Pugs I think of silly clowns. These dogs are mischievous and get away with it because they are so darned cute. I have seen more than one pug dance on its hind legs, especially if there is food around. It is an adorable display which almost always makes everyone around laugh, which I almost think is the intention. Pugs LOVE attention and will often put on quiet the show in order to get it. While with a lot of Pugs it doesn’t matter too much, usually we are called because their people have not given these dogs any rules or boundaries at all and the dog has “taken over the household” and set their own set of rules. They can be moody as well and can pout if you don’t give in. They will usually get over it quickly and are typically compliant dogs that are easy to train as they want to please and get praised. Typical issues are barking for attention, often at meal time. Pugs love to eat and can easily become over-weight if given into. They are also typically pullers on leash until taught to walk with you and not lead. 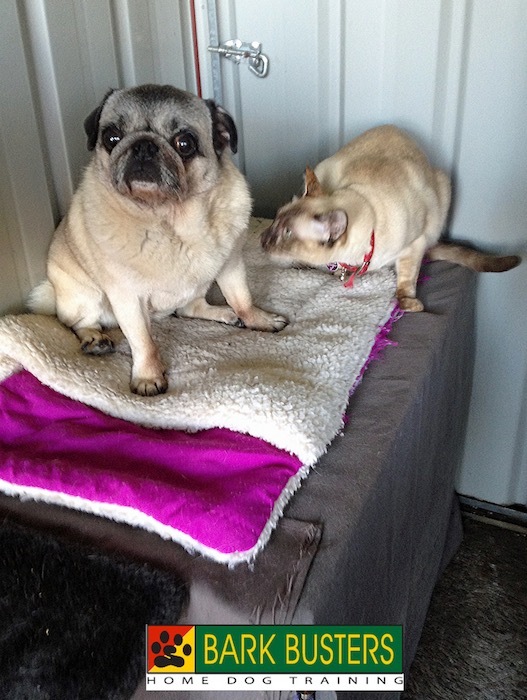 Pugs are usually friendly but can tend to jump on the people they live with and visitors which is another issue we are called to help resolve. Be careful about rewarding with treats as often these dogs will learn to not listen is there isn’t a treat reward, as I said these dogs love to eat. They will try to take advantage of those human treat dispensers. Caution needs to be taken, especially in the summer, as with other flat faced dogs, breathing can be problematic in the heat and humidity of summer. Walks in the summer need to be short because of their physical characteristics. They are not excessively energetic dogs but are usually willing to participate in the family activities. They also do not need a lot of space and so are often good companions for apartment dwellers. Playing inside in the air conditioning during the summer is usually enough physical exercise for Pugs. 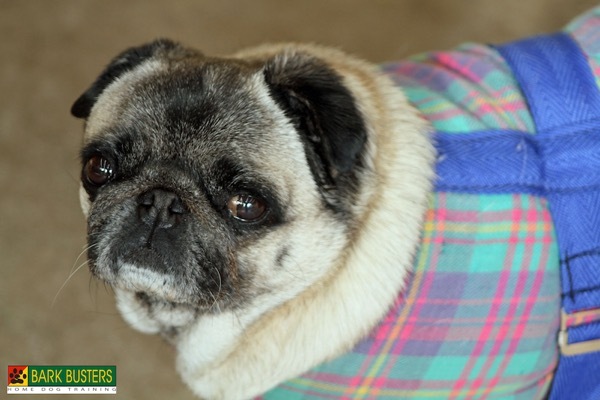 Overall Pugs are wonderful companions, with a cheerful disposition and they are not one of the main breeds we are called to help fix problems with. As with all dogs though, if you aren’t setting rules and boundaries, they will make up their own, which may not be in line with your thoughts and feelings. While, as I mentioned, they are not one of the dogs that we get huge numbers of calls for help with, Dogs are all individuals and so their individuality needs to be considered when working with them. 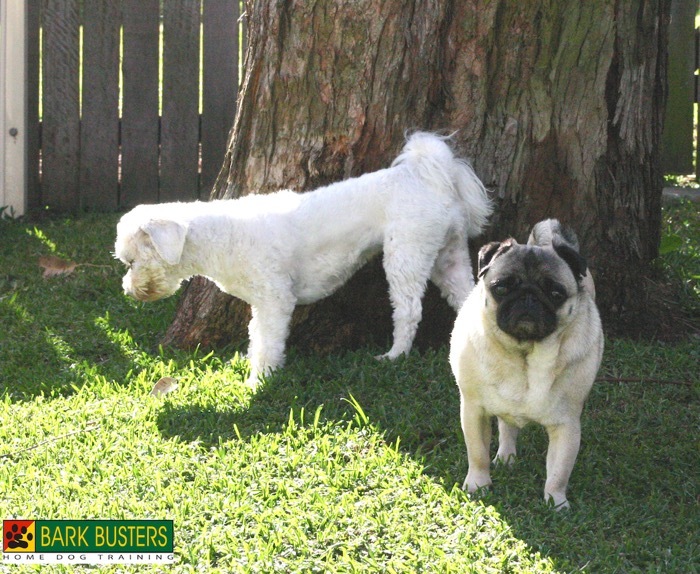 Bark Busters Trainers’ unequalled experience at helping dog owners resolve problems can usually help owners of Pugs quickly, so if you do have issues with your Pug, call us today so you can get help quickly and have a long wonderful relationship with your four-legged comedian. 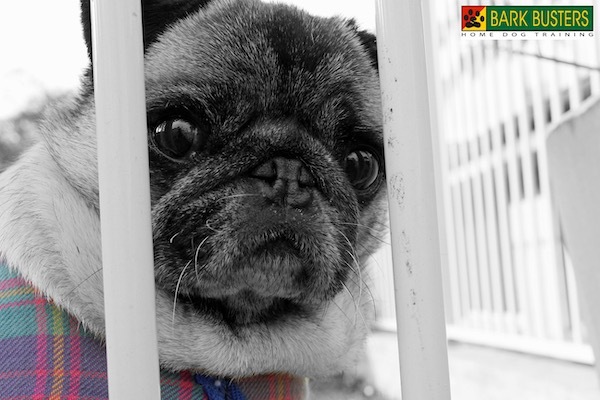 If you are looking for a Pug puppy or adult dog, we recommend you first check in with all the Pug Rescue Organizations. There are many great dogs looking for good homes! Check all local shelters as well as sometimes they have Pugs that for no fault of theirs have ended up there. Be sure to speak to shelter management to find out why the dog was surrendered. Shelters work really hard to match the right owners with the right dogs, it’s not just about finding homes, they try to find that ‘forever home’. Sometimes a mixed breed with Pug in the mix might be a good way to go. If you strike out, then be sure choose a reputable breeder. Check out the AKC for a list of breeders close to you. Many dogs are abandoned for the wrong reasons and some folks are not fully prepared to do what it takes to train and educate a dog. All Shelters give their dogs health checks to make sure they are in good shape and up-to-date on vaccinations and will make you aware of any behavioral issues. Bark Busters® trainers work with many local shelters to help overcome any behavioral issues before a dog is adopted. A good breeder will try and screen out all the health problems inherent to the breed as much as possible. They should be happy to answer your questions about temperament and health considerations and should ask you questions about your lifestyle and goals. Many breeders are registered with the American Kennel Club, where they abide by certain policies and screening. Is it hyperactive or too much of a handful for me? How is it around other pets? Does it seem aggressive with children or other dogs? What is its personality like? What do you know about its Mom and Dad? Are there any inherent health issues that you know? Before you decide on a Pug puppy, ask yourself if you would be better off with an adult Pug, that would mean lower maintenance and lower energy. Puppies are fun, but they are also a lot of work. Whether you acquire a puppy or adult make sure you take your dog to the vet soon after adoption to identify and prevent any problems and to check on its immunization and de-sexing needs. 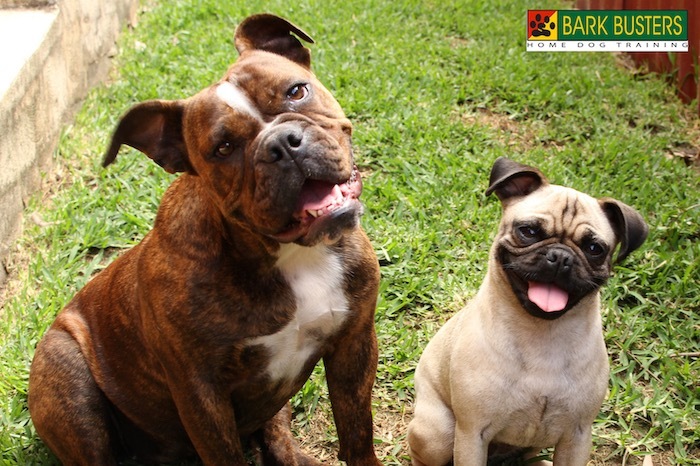 Bark Busters believes that a dog has four basic needs and if you adhere to this philosophy you can’t go wrong. Basic Need #1 Food- Adequate Nutrition. All dogs need adequate nutrition if you want a healthy dog that is fit for life. Any diet must be adequate for your Pug’s nutritional needs. A poor-quality diet is not conducive to having a healthy pet. Make sure you do your research into diet and what is best for your dog. One thing we have discovered is that dogs fed on a high grain diet, can become very energetic and overly excitable. They can be allergic to some grains and suffer skin reactions and flare ups. Be sure to conduct research on a grain free diet, free of colors and harmful additives. Every dog needs its own space, a comfortable place to call his own. Just the same way children need their own room a dog needs its own space, a place it can go when it needs to get some peace and quiet. Create a bed for your dog that is exclusively its place. Make sure it is warm and covered. Create a den like place, dog love dens, that can be covered and dark for them. When we are called upon to treat behavioral issues, we often find that the dog has no designated sleeping area. Some dogs wander aimlessly around the house, sleeping in several different places, but they don’t have a definite designated bed of their own. When it comes to their dog, many people think of security as providing a safe place for their dog to live, free from harm, but a dog’s idea of security is different in that they also need to belong a strong social group to feel secure. Its needs a leader and someone it can look to for direction. Just having a perceived, safe place is not enough for a dog. A dog might be in a safe place, but if it has feelings of insecurity that stem form a lack of leadership, then a normally confident dog might feel threatened by the sounds around it. Dogs need and crave ‘leadership’. Make sure you provide guidance and structure to your Pug. We always say; if the top dog position is not available, the dog won’t apply for the job’. Simply said, that if you want a well-adjusted and well-behaved Pug, then you need to set some rules and stick to them. We mention ‘consistency’ a lot, but dogs are creatures of habit and they thrive on consistency from their leaders. Topping off our four basic needs, the ‘last but not least’, is entertainment. Dog’s don’t watch TV or read books, they need something to occupy their active minds. Mind stimulation is more important than physical exercise. Your Pug will tire far quicker if you give him some entertainment that gets him using his brain. A walk is always good, but you can’t walk all day and some aged dogs cannot walk too far at all. So, make sure you look to provide some entertainment for your dog. Pugs are just like many other breeds and love to play games. First, be mindful of your particular dog’s energy level. 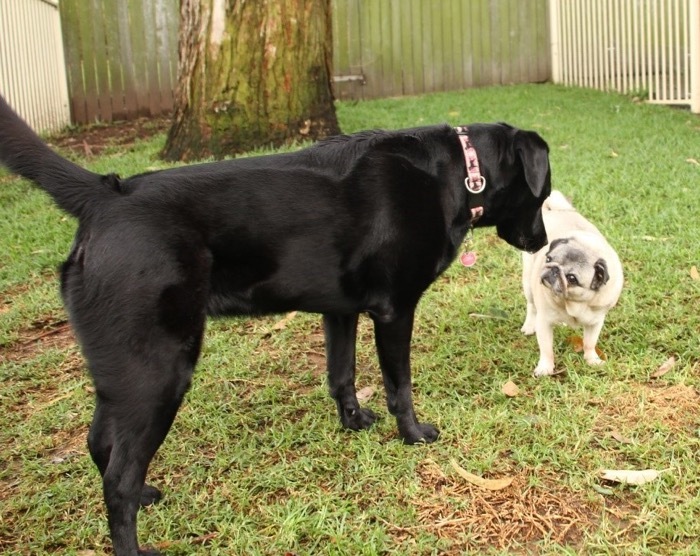 Also, remember your Pug’s anatomy (especially it’s face/snout) when choosing to play. Pugs can easily become exhausted and worn out, especially in hot weather, so don’t overdo it. Hide and Seek. Hide a ball/treat/yourself throughout your home and encourage your dog to find where it is! 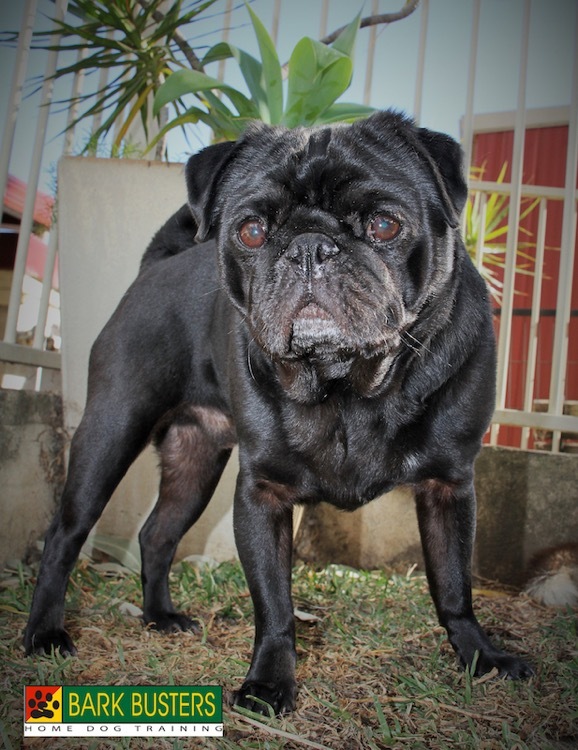 Fetch – Pugs are great sports and love to chase balls and play with toys. Your dog will love a rousing game of fetch (challenge yourself to see how far you can throw it). Also teach the command of “out” once it has brought the object back to you. Walking – This classic form of exercise is still great for all breeds, but make sure you don’t over-work your Pug.. In addition to physical entertainment, your Pug will benefit from some brain work. Our dogs need mental stimulation as part of their daily routine. A great interactive toy is the GameChanger® by Bark Busters®. 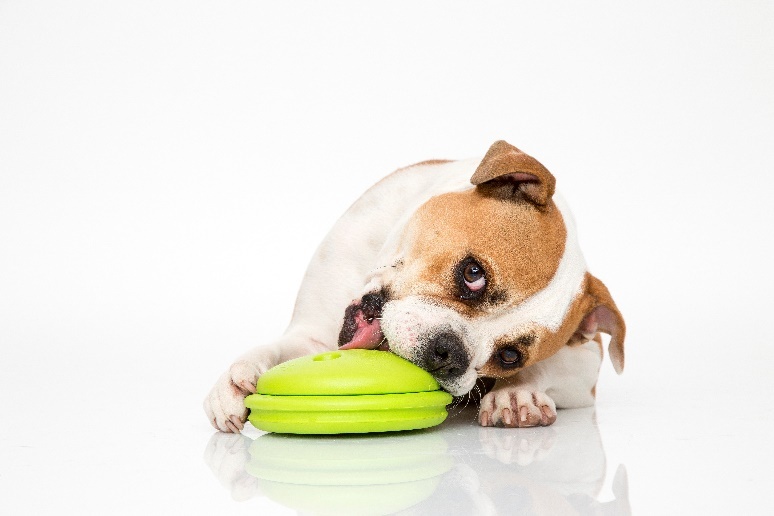 Not only is this toy safe (made of FlexaPure - durable non-toxic PBA-free polyurethane material), but it stimulates a dog’s natural desire to chew. You fill the toy with some small treats, and your Pug must decide how to get the treats out through the small holes. It will keep them entertained for hours! If you have ever lost your dog, you know that heart-pounding adrenaline of panic. The WaggTagg™ pet identification tag is unique in that it works from a QR code. Free to all Bark Busters® clients. The pet parent enters important dog information plus a picture. Whoever finds the dog can simply scan the tag using a cell phone and the owner gets a text message to say someone has found your dog. This service is available 24/7. No waiting to get to the vet office to scan a microchip and no renewal fees or any extra charges! Microchips are important and you should always have your dog microchipped as that is a great tool to identify legal owners etc. The WaggTagg™ is an extra piece of security for your dog and provides peace of mind, that if your dog goes missing, you can get reunited quickly. 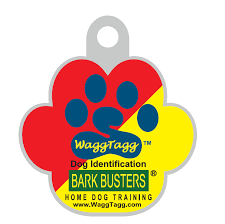 WaggTagg ™ is a free service for all dog owners when you become a Bark Busters® client. 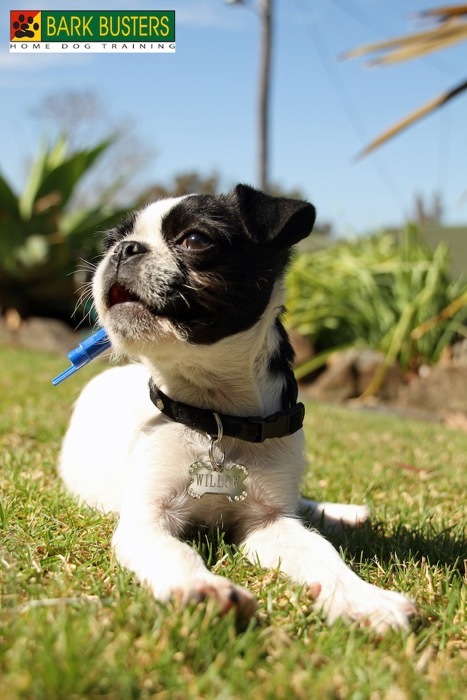 These harnesses are ideal for those little dogs like the Pug that may pull on the leash. Pulling while walking is not good for your dog and can damage its skeletal frame and do damage to its trachea. As previously mentioned, early education is important. Making sure your Pug walks properly on a leash is an important exercise. If your dog pulls on the leash, it can be damaging its skeletal frame. You should always start this training in the home and start with short walks and make them fun and educational. No need to go for long walks while educating. Always start with a fixed collar and accustom your puppy to the feel of the new collar. It will feel odd at first and they will try and scratch at it. Always try to distract them using a treat or a toy. Many folks struggle to control their dogs when out on a walk regardless of their size. It just takes patience and know how to get your Pug walking correctly on a loose leash. 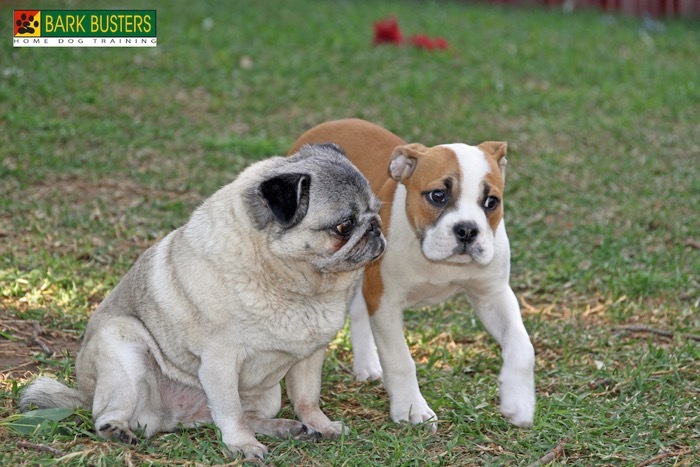 We recommend starting when your Pug is still a puppy and educating your puppy where you want it to walk. That should not be straining at the leash. Bark Busters® are often asked why dogs pull on the leash and concerned ‘pet parents’ worry that their dog will be injured with all this pulling. Not to mention the toll the pulling takes on the human, the answer is simple, it’s all down to using the right technique, coupled with the right leash and equipment. To understand what we mean, we have to first explain why dogs pull on the leash. Dogs are natural pullers. It’s in a dog’s DNA to pull against any restraint. In the wild if an animal is trapped, it will naturally try to get away. It knows it is vulnerable if it is captured or tethered. Although the canine has been domesticated for thousands of years, your dog still has this instinct in its mind. The only way to avoid this natural pulling, is to learn to get your dog to walk on a loose leash. Dogs are natural pullers and whenever they feel any restraint on their body, be it a collar or harness that is attached to a tight leash. Its in a dog’s DNA to pull against any restraint. That is why it is possible to get a dog will pull a sled, they feel the restraint and naturally pull against the restraint. This is normal dog behavior, but we can alter the dog’s perception if we always keep the dog on a loose leash, where it feels NO restraint. The Waggwalker is a walking harness designed by dog trainers to communicate and educate dogs how to walk sedately on the leash. 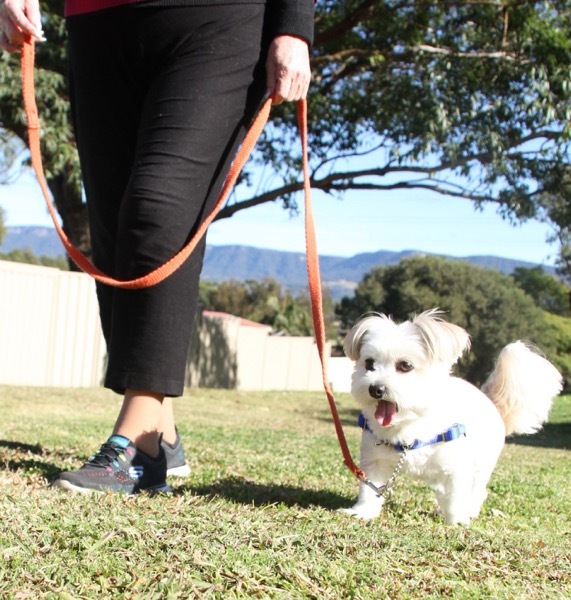 The WAGGWALKER®makes it easier to walk your dog because it provides a way of communicating, through sound and with no pain, letting your dog know when it is out of position and exactly where you want your dog to walk, so ‘take the lead and get tails wagging’.